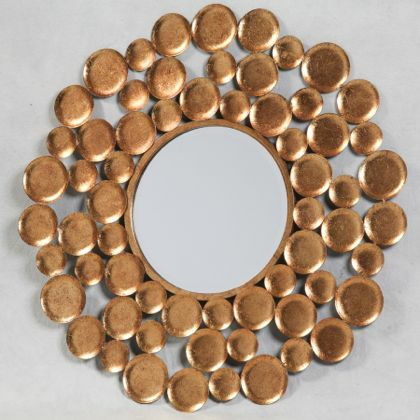 This beautiful gold discs mirror is a wonderful feature mirror. The unusual frame,rich hand finished gold paintwork and amazing price make it an attractive purchase. Made of metal but very lightweight it is easily and securely hung from a single screw in the wall. The rich gold colour will enhance any room with its warm tones and is guaranteed to get admiring glances from all your visitors. The mirror itself is still large enough to be useful. Combine it with other gold framed mirrors on a single wall and you will be bang on trend with the random fish mash style that is any and all styles together – if you like it have it! Measuring 80 x 80cm (mirror is 33 x 33) it is a great size in any home. Please do take a look around our on-line store as there are hundreds more wonderful items to be seen. If this gold discs mirror is not the one you are looking for, we have many many more chandeliers, sconces, table lamps, floor lamps, wall lamps and other lighting items. Our lavish selection of gifts, mirrors, french furniture, lamps, chandeliers and vintage style home accessories will inspire you. Updating a bedroom perhaps? Starting afresh in an exciting new home? Revamping a living room? Or simply adding refreshing feature accents to your lovely home, we are your one stop vintage shop! I’m here to help so please do feel free to contact me with any queries you may have.